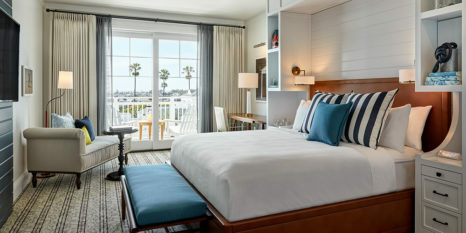 NEWPORT BEACH, Calif, 2018-May-18 — /Travel PR News/ — Autograph Collection Hotels, part of Marriott International, Inc., together with R.D. Olson Development today announced the opening of Lido House, a stylish celebration of Southern California’s iconic coastal lifestyle in the heart of Newport Beach. Lido House joins the brand’s diverse portfolio of more than 140 one-of-a-kind hotels that champion visionary owners, thoughtful design and craft. Set to serve as Newport Beach’s new culinary hot spot, Lido House offers a variety of distinct dining options to satisfy every craving and occasion. The Mayor’s Table Pacific Pub & Kitchen, the hotel’s signature restaurant, honors the site’s City Hall roots in its name and its comfortable, contemporary design with a menu of sustainable seafood and vegetable-forward fare; inventive, chef-driven cocktails; a raw bar; chef’s counter and vibrant open action kitchen. Topside Roofdeck serves as Lido House’s captivating rooftop bar – the only in Newport Beach – offering a lively, sophisticated scene; while Crew Coffee + Cremerie offers up curated blends of coffee and classic ice creams, made with ingredients from around the globe and served up with a decadent twist. For more information, please visit: www.lidohousehotel.com or www.autographcollection.com. This entry was posted in Hotels, Travel, Travel Management, Travel Services, Travelers and tagged Autograph Collection Hotels, Jennifer Connell, Lido House, Marriott International, Newport Beach, R.D. Olson Development, Robert D. Olson. Bookmark the permalink.